Additional Info: The fjord is the soul of Norway and certainly its most magnificent attraction. Many of the highest waterfalls are in Norway. Much of Norway is dominated by mountainous or high terrain, with a great variety of natural features caused by prehistoric glaciers and varied topography. The most noticeable of these are the fjords: Deep grooves cut into the land flooded by the sea following the end of the Ice Age, the longest is Sognefjorden. Norway also contains many glaciers and waterfalls. Jotunheimen is a mountain range in southern Norway and is part of the long Scandinavian Mountains range. The 26 highest mountains in Norway are in Jotunheimen, including the very highest - Galdhopiggen (2,469m). Jotunheimen is very popular among hikers and climbers, and the Norwegian Mountain Touring Association maintains a number mountain lodges in the area, as well as marked trails between the lodges and to some of the peaks. It is possible to walk from hut to hut so camping equipment is not required. The huts come in three varieties: full-service huts, where food is served; self-service huts where you can buy food and have to cook it yourself in the kitchen; and no-service huts, having a stove and beds with blankets like the self-service huts but where you cannot buy food. Prices per night range from 30-50 Euros - they take Visa! Most valley paths and some of the summit tours are T-marked. This means that a red "T" has been painted on an upright stone. Most often, these stones are piled up into a cairn. Every so often, you will see a cairn and a T-mark. When a path forks, there will be signposts. If you keep to the markings, you probably won't have to look on your map for a whole day. The Coastal Route (310 miles approx). Starting in Svinesund and finishing up in Flekkefjord, this is a great bike friendly route for the most part. The trip is signposted with special signs except from Lillesand to Kristiansand and from Vigeland and Flekkefjord. There are many attractions and other things to do along the Coastal Route, including: Borrehaugene, (Borre burial mounds) - burial mounds that comprise the very first national park in Norway featuring North Europe's most extensive collection of graves of Kings of the House of Ynglinge; Hvalfangstmuseum - the only museum in Europe dedicated to whaling; Eventyrhuset (fairytale house) - lose yourself in one of the good old fairytales about Askeladden and the Princess; Lyngor - An island just a short boat trip from Gjeving, voted Europe's most well preserved township; Bronseplassen a reconstructed Bronze Age farm; and, much more. The Numedal Cycleroute (175 miles approx.). From Geilo - Larvik, this route follows the river Numedalslagen. The entire route is signposted. From Geilo to Dagalifjell the terrain is hilly. The hard going is rewarded by magnificent, panoramic views and many downhill slopes. Numedal is famous for its many buildings dating back to the Middle Ages (before year 1537), four stave churches and as many as 41 other constructions. Old mining traditions have left their mark and traces of this culture are to be found everywhere in Kongsberg. 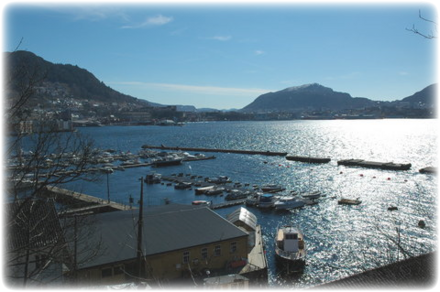 A visit to the Norsk Bergverksmuseum and silver mines in Saggrenda is considered a "must". The beautiful old church in Kongsberg and the Lagdalsmuseet are also well worth a visit.